At Arlington Pediatric Dentistry, we love your children! Our goal is to ensure a safe and comfortable environment for every child. Our doctors have offered this type of service to patients for ten years, making us the experienced Arlington kids’ dentist you have come to trust for a typical exam or more complicated orthodontic treatment. 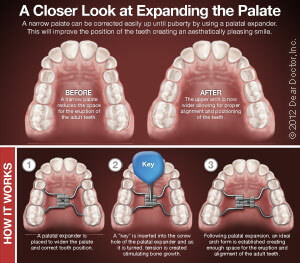 One situation that we commonly see is the need for palatal expanders. These appliances are designed to pull from a child’s natural growth process to tenderly expand the upper jaw. There are three reasons we might recommend this type of treatment. Impacted Teeth – When permanent teeth cannot erupt because others are in the way. Crossbite – When the upper teeth sit behind the lower teeth. Crowded Teeth – When the teeth overlap in front of and behind each other, sometimes causing pain or difficulty with dental hygiene. 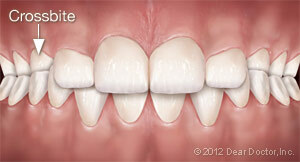 We make a custom expander that will fit perfectly inside the patient’s mouth and over some of the upper molars. A screw in the center of the device is turned to induce palatal bone tension. This allows them to slowly separate. It might feel tight for just a minute or two, but shouldn’t cause pain any longer. Each day, the screw is turned just a tiny bit more. After the jaw is expanded far enough, the appliance will remain in the mouth, allowing bone growth and stabilization of the gap. This could take a few months. 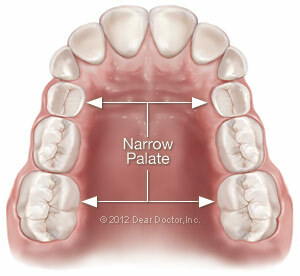 Keep in mind that as the jaw widens, there will be gaps that appear between your child’s teeth. This is great! It means the appliance is doing its job. If you have questions about palatal expanders, contact us today and one of our friendly, knowledgeable staff members will be happy to help. We can also schedule an appointment or consultation for you at your convenience. We look forward to helping your child obtain a healthy, beautiful smile.